HR Panel is provided with a Deployment Module named WAR File Deployment for Java Hosting Customers which is the simple and faster tool to deploy the WAR files, which contain all the application-related files and are served by the application server. The Web application ARchive file is commonly known as war file is an archive that contains all the parts of a web application like Java class files for servlets and web services, JSP , HTML pages, images, and JAR libraries, static web pages and other resources which are required to run the application combined in single unit. It is used to distribute a Java-based web application and is a packaged web application. It is mainly used to import web application to the web server. And is similar to JAR that has the same file structure, which is a single compressed file that contains multiple files bundled inside it. It is a common format for distributing Java applications and supported by a wide range of tools. But WAR files cannot be edited while the application is running. Any changes require rebuilding the file. The WAR file is simply a JAR file with specified directories for the Java code and one designated configuration file like the web.xml file, which tells the application server what to run and how to run it. WAR files always have the extension .war, but they can be created and read with the standard JAR tool. 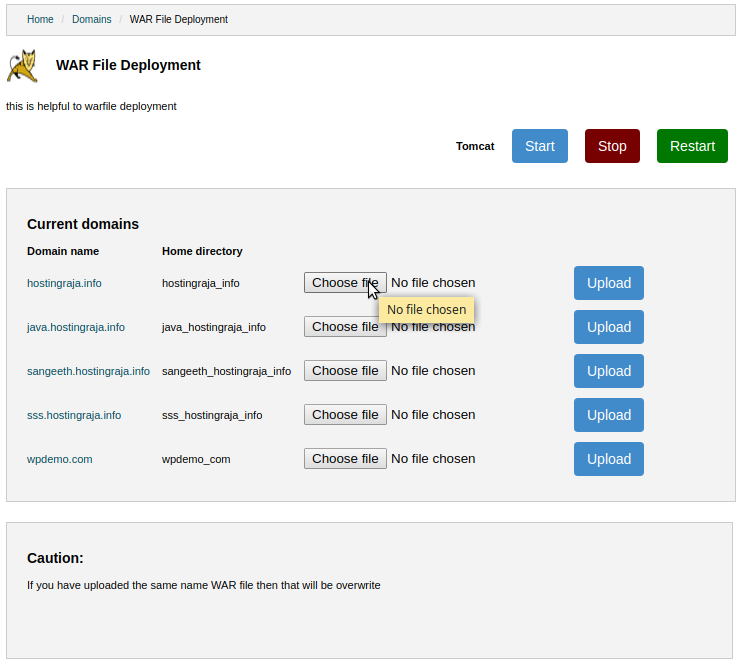 WAR file has a clear advantage when properties files are used to identify environment specific variables by which the developers can be certain that the WAR file tested and verified is exactly the same as which is being promoted to production. Step 3: after you select the file and click on Upload. It will take some time to get uploaded and to get configured based on file size. Step4: Once War file is uploaded completed >> you to restart the tomcat click on Restart which is present in the top position. Note: If you add the war file which is having the same name as earlier the file will get overwritten, Make sure before you upload any war file. 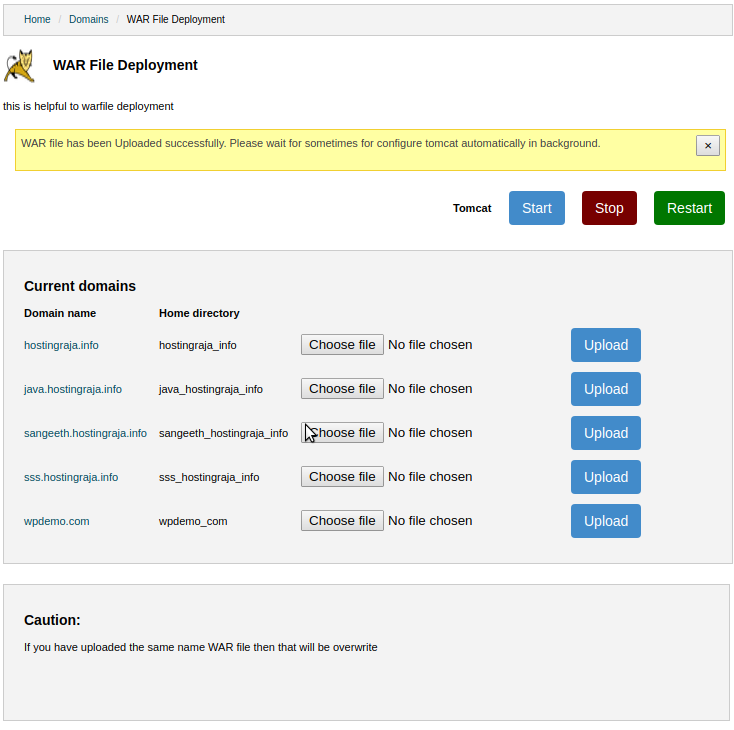 Following the above steps, you can deploy your war application in your server and test. If you are facing any issue or if you have any clarification, feel free to contact our support team via live chat, email, toll-free or ticket system and our support team is available 24/7. JAR files (java archive files ) and War (web application archive files) are similar both are types of files, archive files that are used to package different modules and different functions, these created for web applications and for holding many files together. JAR allows formation the multiple files into a single file which used in the library to hold the java classes or utility along with some files that are static like images and videos, it is easier to access. The EJB module is packaged as JAR files which contain contains EJB descriptor and Java beans class files These are packaged with a .JAR extension, the JAR files are underneath the WEB-INF/classes directories and WEB-INF /lib. War files might store Java classes, XML and Java servlet pages for different applications of the web and this web module is packaged as WAR files which contain contains JSP files, Servlet class files, Supporting files, HTML, and GIF and are packaged as a .war extension. Visit this page, to buy Linux VPS Hosting. Visit this page, to buy Windows VPS Hosting.